After a month time interval I had an opportunity to go outings in Japan, This time the idea to know the ancient Japanese pottery making has been sparked by Mr.Uchida (Our Guarantor). Hence we have chosen to visit a place about 100kms away from Tokyo called Mashiko. The 2nd day of 2007 morning 10:00AM our team has set ready for the tour to Mashiko. Mr.Uchida also had never been to this place; hence our tracking of route on the car was solely depended on the GPS system installed. The in car navigator has been set starting point Nishi Funabashi and destination as Mashiko Information center the community building. It quickly recognised the starting and destination points and showed the entire travel distance as 106kms and 2:37mins has driving time. We had chosen to travel the local roads in stead of the Highway as everybody requested to see the scenic country side of Japan. The car started its journey with 6 people on board. It was a pleasant trip to us to experience the relaxed life outside Tokyo. The villages on the way to Mashiko had full of Salvage yards and used car dealers’ show casing numerous cars that were used in the roads of Japan. In a short while after an hour and half drive we stop at Seven Eleven a convenio store on the roadside for our meal. Mashiko is a famous country town during Nara Era (A.D. 710-784) for manufacturing pottery goods. Due to several political changes in Japan the Mashiko had to loose its glory and blurred the pottery business. The current Mashiko contributes to Japan as tourism attraction exhibiting the classical age pottery manufacturing techniques. There are several schools teaches the pottery manufacturing art. There visitors can pay as low as 1000yen for a guided pottery manufacturing tour during which they can make their own pottery, there will be a additional charge for boiling the visitor made pottery and shipping it to the visitors address in Japan after 2-3 days of the whole process. There were many pottery shops in the area to attract visitors, but majority of the shops sells the ceramic owl dolls and Japanese style bear dolls. I have spotted these bear dolls in many Isakaya (small Japanese style hotel) establishments in Tokyo earlier. There is a Giant sized bear statue is also seen on the Mashiko central area as a landmark. Many of the information boards in this area are written in English as an exception but several letters in those boards were missing due to lack of maintenance. But it doesn’t stop us reading that partial information seen on the board. 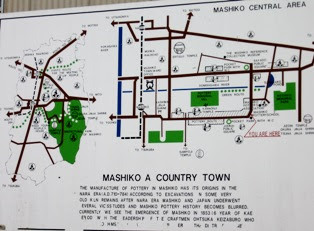 The area information office provides detailed map and information flyers to those who visit Mashiko. There is plenty of car parking available around the attractions in Mashiko. The Mashiko area is filled with pottery makers and shrines of ancient Japanese Nara Era. After a while we have moved towards Samyoji temple in Mashiko from that point our travel has started towards Tokyo. Apart from the salvage yards and used car dealers the way to Mashiko also had several villages with rice fields. I have a plan to visit one of their villages soon to discover the farmer’s life in Japan and the techniques they use in the cultivations. Great information here! I have been searching for places which has a big value on pottery. Glad that I found this Mashiko, Japan as known to be the pottery paradise in Japan.I'm excited to see more creative designs as well. Finding (Information of) a Geisha!